The American Trucking Associations reported that truck tonnage increased 1.2% in January. The ATA's Truck Tonnage Index hit an all time high at 135.7 last month. CBLPRD can be called now at the issuer's option. It is possible that CBL will call the security provided it can refinance at a sufficiently lower rate to make it worthwhile. CBLPRC, which had a 7.75% coupon. was redeemed in November 2012. CBL Announces Redemption of 7.75% Series C Cumulative Redeemable Preferred Stock My first buy of that one was near $10. I am pleased that I have not lost money on any of those preferred stocks yet, and I would like to keep that way. Rationale: I see more downside risk than upside potential at a $26.06 price, which represents a 4.24% premium to the $25 par value. Future Buys: I will consider buying this preferred stock back in an IRA when its current yield exceeds 8%. 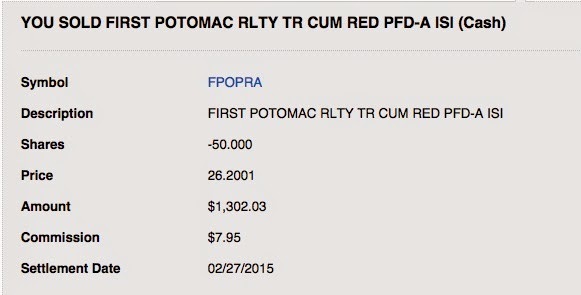 Security Description: The First Potomac Realty Trust Cumulative Preferred Stock Series A. FPO.PA) is an equity preferred stock issued by the REIT First Potomac Realty Trust (FPO:NYSE). This preferred stock pays cumulative and non-qualified dividends at the fixed coupon rate of 7.75% on a $25 par value. Distributions are paid quarterly. FPO has the option to redeem this security on or after 1/18/2016. There is a typical dividend stopper clause contained in the prospectus at page S-18. Rationale: I see more downside risk than upside potential at a $26.2 price, which represents a 4.8% premium to par value. Future Buys/Sells: I will consider repurchasing this preferred stock when and if the price falls below my last purchase price. This stock went ex dividend for a AUD$.054 distribution three days after my purchase. 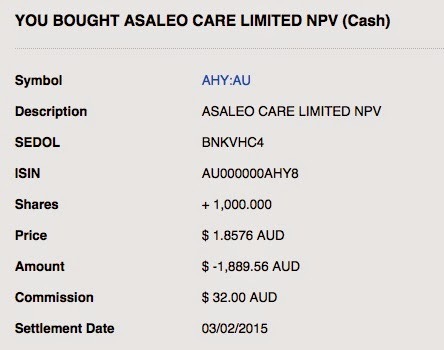 Asaleo Care Ltd - Bloomberg The company currently intends to pay out 70% to 80% of statutory net profits after tax (NPAT). I can not link the reference, but I am referring to page 11 of 115 in the "Appendix 4E for 2014 Financial Year", which can be downloaded for review at Asaleo Care. When I placed the trade at approximately 10:00 P.M. CST, the rate was 1.2764 or about 1.35%. The fee is supposed to be 1% which is built into the exchange rate. Asaleo's products are distributed in Australia, New Zealand and Fiji. For 2015, the company is currently projecting low to mid single digit growth in net profit before taxes, and it does not anticipate paying Australian income taxes until F/Y 2016. The company did pay $2.5M in tax to New Zealand in F/Y 2014 and $.4M to Fiji. Svenska Cellulosa AB (SCAB:STO) owned 32.5% of Asaleo's shares as of 12/31/14. 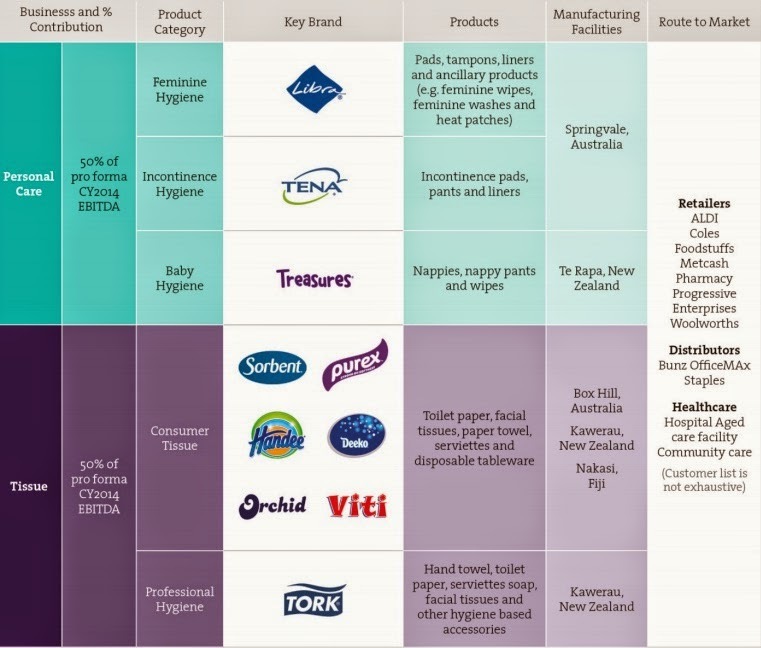 I own 50 shares of Svenska's ADR which has performed well since my purchase: Bought Svenska Cellulosa (SVCBY)-A Swedish Personal Care And Tissue Company - South Gent | Seeking Alpha I mentioned Asaleo when discussing that purchase. 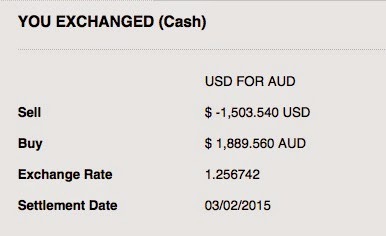 Last Earnings Report: All amounts are expressed in Australian Dollars. The fiscal 2014 results were adversely impacted by significant non-recurring costs connected to the firm's IPO. Those items are described at page 26 of the Appendix referenced above. The company has drawn $271M on its $350M credit facility as of 12/31/14 at an "all up" cost of 4.4%. Rationale: The primary reasons are diversification, valuation and dividend support. Bloomberg has the P/E at 13.74 based on estimated 2015 E.P.S and a AUD$1.8 share price. That is cheaper than other personal care product companies. I also was able to acquire shares at a discount due to using my USDs to make the purchase. I will soon receive a dividend paid in AUDs. While that dividend will not be franked, future dividends starting in F/Y 2016 may be partially or entirely franked depending on the company's tax rate. Risks: The company summarizes risks incident to its operations starting at page 35 of the previously referenced Appendix 4E available for download at Asaleo Care. This company is a small minnow in a highly competitive industry. The company's history as a public company is of recent vintage. Needless to say, an investor who is not a long term owner of AUDs is exposed to currency risk when buying a foreign stock after converting their native currency into the foreign local currency in order to complete the purchase. I published an SA Instablog earlier today discussing yesterday's purchase of 150 AEG shares. I was concerned that a SA commenter, who goes by the name SDS, might report me again to the SA police. Just kidding here. His troll like nonsensical assertions, made without an iota of factual justification, included a claim that I was falsely categorizing a discussion of a dividend paying stock in SA's "Income Investing" category and that my posts were "spam" and some kind of "push scheme" since I was discussing "obscure dividend stocks", which was a reference to two of the largest banks in the world whose dividend yields were far higher than the S & P 500 average. Actually, I believe that it is SA that put that category on my Instablogs when they made the decision to publish one as an article. I am sporadically writing another post for publication here but I am spending more time watching House of Cards released yesterday by Netflix. According to data compiled by Wells Capital, the median P/E for NYSE listed stocks with positive earnings was substantially higher in 2014 than in 2000. The excessive valuations for large capitalization stocks caused the overall P/E numbers to be higher in 2000. Company Description: The Australia & New Zealand Banking Group Ltd. (ANZBY) is one of the top four banks based in Australia and is within the top 25 banks globally based on market capitalization. I took a snapshot of the annual reported financial information starting in 2010 through 2014 that shows improving results. Basic earnings per share increased from $1.789 to $2.671. The dividend increased from $1.26 to $1.78. Tangible book value per share increased by 41.13%. The 2014 tangible book value per share was reported at $14.65. At at AUD$35.05 price, the shares were selling at 2.39 times tangible book. Comparison Chart ANZBY vs. ANZ:AU: The following chart highlights both the currency risk and opportunity inherent whenever an investor buys a USD priced ADR. The price of the ADR will reflect the ordinary share price in its local currency converted into USDs. Over the past year, the AUD has fallen significantly in value against the USD and that decline will flow through into the performance of the USD priced ANZBY causing the ADR to underperform the ordinary shares priced in AUDs. The AUD/USD hit a high around 1.1035 on 7/28/11. If the ordinary shares had closed at AUD$35.04 that day, the closing price from 2/23/15, the equivalent USD price for the ADR would be $38.6665, or a 42.54% gain in the ADR price just from that increase in the AUD's conversion value into USDs. By buying the ADR on 2/23/15, I can only say with certainty that the currency risk between 1.1035 and .7846 has been removed from the ADR purchase. I now have the downside risk below .7846 and the upside potential above that number. Dividends: The dividend growth history is good for a bank, except for the Near Depression period when the dividend was cut. Dividends are paid semi-annually with the first payment made in July with a May record date and the larger amount paid in December. 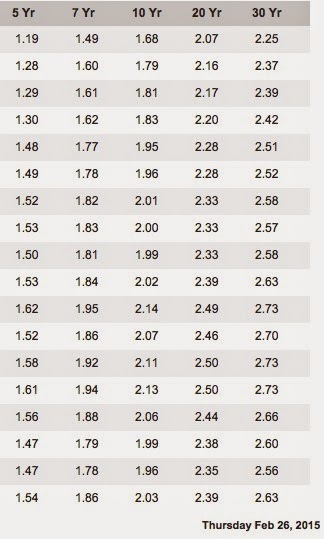 The dividend growth rate is shown in the following table. The 2003 annual rate was AUD$.98 which had grown to AUD$1.78 in 2014. 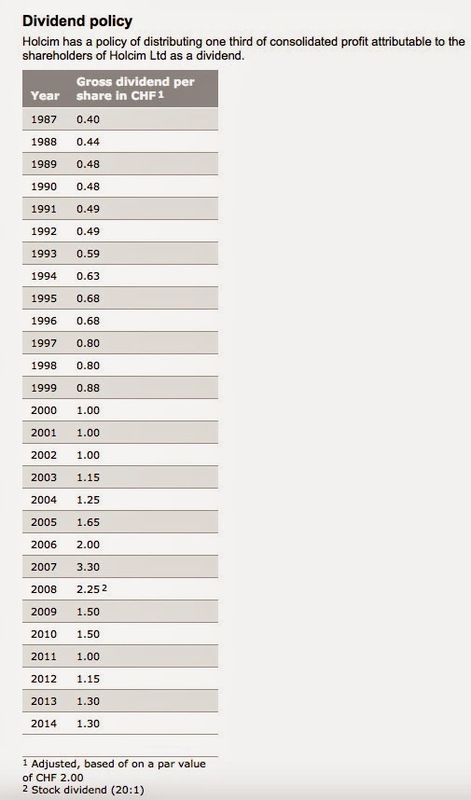 The dividend was cut in the Near Depression period, going from AUD$1.36 in 2007-2008 to AUD$1.02 in 2009. The bank then started to raise the rates in 2010 to the present. The 2011 rate of AUD$1.4 surpassed the annual rate in existence before the slash. The actual amount per ADR share will vary based on the dividend paid in AUDs and the conversion rate from AUDs into USDs. The foregoing just gives me a ballpark kind of guess. The dividend yield would be higher based on the AUD/USD gaining in value above .7892 used for purposes of the preceding hypothetical and will also change based on an increase in the dividend rate above what was paid in 2014. For the first quarter of the 2015 F/Y, the bank reported an unaudited cash profit of AUD$1.79B, up slightly from AUD$1.73B in the 2014 F/Y first quarter. Rationale: I am treading cautiously given the risks discussed below. 1. The current dividend yield is close to 5.15%, based on the assumptions outlined in the dividend section above, and ANZ has a long history of dividend raises and one modern era dividend cut. 2. A lot of the currency risk has been eliminated with the AUD/USD at .78. While the AUD could continue to decline, I simply view the balance of the currency risk/reward to tilt in favor of reward at that level. A substantial price gain could be realized by a return to parity assuming no change in the AUD priced ordinary shares. 3. The expansion outside of Australia and New Zealand gives the bank exposure to Asia's growth markets. 4. The bank appears to be adequately capitalized and prudently managed as shown by its performance in the Near Depression period compared to similar sized institutions in the U.S. and Europe. The 2011 Annual-Report shows a decline in profitability from AUD$ 4.18B (2007) to AUD$2.943B (2009) but the profit then accelerated back to AUD$4.401B in 2010 (page 84). Overall, I view that decline and rebound positively under the circumstances and particularly compared to other large banking institutions in developed markets outside of Canada and Australia. Risks: I would classify the currency risk and a possible meltdown in Australian property values to be among the primary risks. The currency risk is highlighted by the one year comparison chart shown above. The concerns about Australian and Canadian banks are similar. The concern involves a potentially dangerous mix of rapidly increasing home prices outpacing growth in real disposable incomes in the context of abnormally high consumer debt levels to disposable income. In Australia, the problem is being aggravated now by banks increasing the number of interest only loans that are more susceptible to defaults. I suspect that is being done to make the payments affordable to some families but that practice needs to stop altogether. It helps to catapult prices higher in an unsustainable manner. Real household wealth hit $323,000 at the end of 2013. The average real price of residential dwellings was reported at $539,400 as of 12/31/13, up from $500,700 in September 2012. "Don’t lose sleep over mortgage debts" - QV Equities Ltd.
A recent stress test conducted by the Australian regulatory authority highlighted the ability of the Australian banks to weather a significant downturn. An ongoing regulatory review may require Australian banks to increase their capital. Bloomberg Business; Murray Financial System Inquiry recommends raising capital requirements for Australian ADIs There are securities other than common stock that meet the equity capital qualifications. The company describes risks incident to its operations starting at page 197 of its 2014 Annual Report.pdf. I do not have a target price. I may average down, but not up. Given my assessment of the risks, I doubt that I will accumulate more than 100 shares. I also currently own National Bank of Australia. If I see more prudent home lending practices, and a much needed slowdown in the currently hot property markets, I will consider buying more than that current limit. I also currently own National Bank of Australia, and have traded that stock in the past successfully so far. The ADR has gone nowhere over the past five years: HCMLY Interactive Stock Chart The current price is about where the stock was trading back in April 2010. Since that time, the shares have traded down to near $10 and as high as $18.50+ last year. The shares certainly do not qualify as a momentum play. The stock does not qualify under my dividend growth strategy or my large cap valuation strategy. This stock is basically an outlier to all strategies except the one based on feel. The OG feels that the next five years will be better than the last five for this company. The last five years has not been an optimal period for cement and aggregate companies, particularly one with significant operations in Europe. Company Description: Holcim Ltd. ADS (HCMLY) is one of the world's largest suppliers of cement and aggregates (crushed stone, gravel and sand.). The company is based in Switzerland and the primary market for the ordinary shares is the Swiss Stock Exchange. Holcim does have a significant presence in several emerging markets including significant operations in both China and India. The ownership interests in foreign subsidiaries is detailed starting at page 219 of the Annual Report. 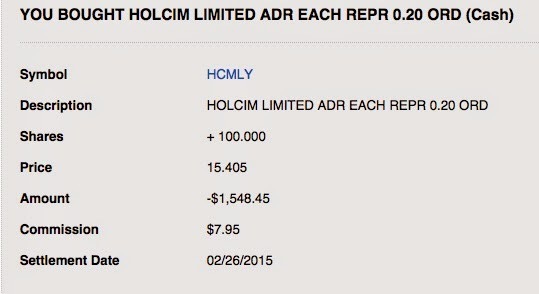 Dividends: Holcim's policy is to distribute one third of consolidated profit attributable to its shareholders as an annual dividend. Given the uneven profit amounts since 2007, the dividend rate was reduced three out of four years before bottoming at CHF 1 per ordinary share or CHF .2 for the ADR. 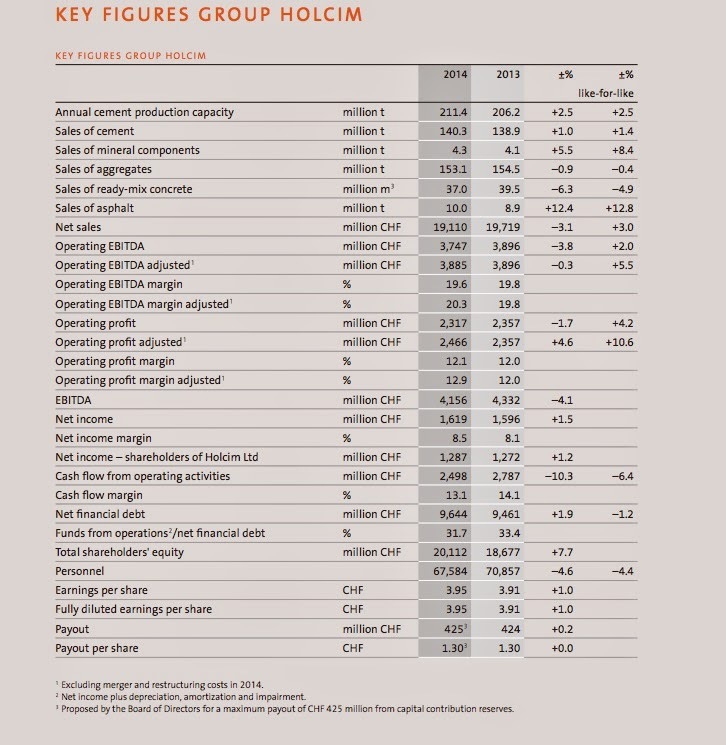 Recent Earnings Report: For the Q/E 12/31/14, Holcim reported a net profit of 355 million francs, significantly better than the consensus estimate of 324M, and up from 233M during the 2013 4th quarter. Net sales increased to 4.87 million francs from 4.78M in the year ago quarter. 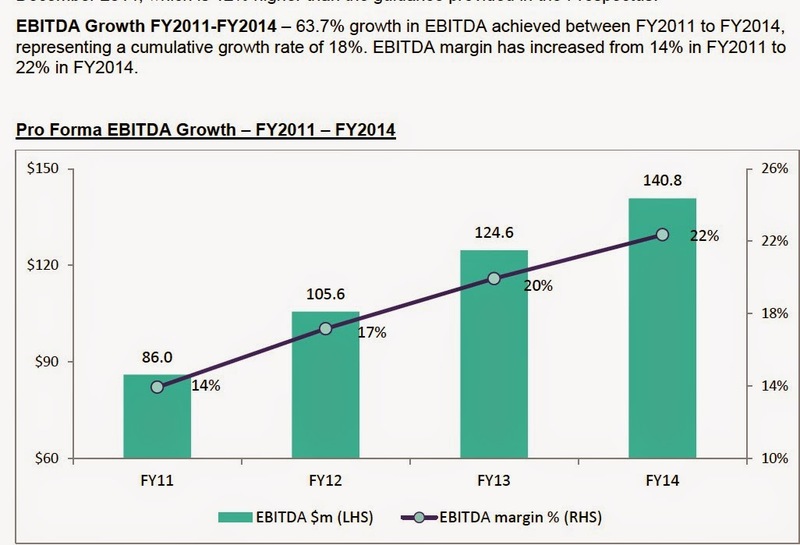 Cost cutting contributed 748M francs to the 2014 operating profit. Rationale: I can not justify this purchase using my standard criteria. The erratic dividend, the dividend cuts, and the low dividend yield obviously disqualify this purchase under a dividend growth strategy. The TTM P/E and estimated P/E based on 2015 E.P.S. estimates are too high for the large cap valuation strategy. Bloomberg has the TTM P/E for the ordinary shares at 18.65 and 17.86 based on the estimated 2015 E.P.S. of CHF4.123, both based on a closing stock price of CHF 73.65. Instead, besides increasing my exposure to assets priced in Swiss Francs, which I generally view as desirable long term, I am playing mostly my relatively upbeat opinions about worldwide demand for this company's products over the next decade. It either happens or it falls flat. The shares have certainly been a disappointment to someone purchasing a position five years ago. Risks: With worldwide operations, including plants in several developing countries, the company is exposed to a variety of currency and country risks. It is hard to say when there will be a worldwide, sustained pick up in demand for cement and aggregates. The company discusses risks incident to its operations starting at page 167 of the 2014 Annual Report. There is also currency risks, and potential currency benefits, to the owner of the USD priced ADR. Generally speaking, a rise in the CHF's value against the USD after my purchase will cause the USD priced ADR to outperform the ordinary shares traded in Switzerland and priced in CHFs. The converse is also true. A decline in the CHF flows through into the price of the ADR. The worst scenario is for both the ordinary shares and the CHF to decline after purchase-the Double Whammy. The best scenario is for the ordinary shares and the CHF to rise after purchase-the Twofer. Future Buys and Sells: I am not likely to buy more. I do not have a target price. I am hoping for a gradual and persistent improvement in worldwide demand for concrete and aggregates that will lead to consistently higher profits and dividends and consequently a much higher share price. That hope is based in large part on my relatively upbeat views about world GDP growth over the next decade. Demand conditions are been poor for cement companies starting with the Near Depression and continuing with its aftershocks that have restrained government spending for infrastructure projects (outside of China) and new residential construction. Rationale: I have decided to gradually eliminate BDCs from my IRAs, now viewing their many disadvantages to be inconsistent with the capital preservation emphasis in those accounts. My tipping point was reached when both FSC and PSEC slashed their dividends and continued to report significant declines in their respective net asset value per share as the external managers feasted on more income for themselves. These two BDCs and several others exist to enrich the external managers. Their relatively high dividend yields are the honey to attract individual investors, desperate for yield, to buy shares, a necessary precondition to the wealth generation for the external managers. Many of those mom and pop investors fail to notice that assets are being incinerated over time that results in a lower share price gradually working its way to zero. I have no ARCC position in an IRA account now and will not initiate one again. I realized my general goal for a BDC stock. I harvested several dividends and exited the position at a profit. While I view ARCC to be the best externally managed BDC, that is faint praise. I have been very critical of externally managed BDCs in this blog, and I am now just fed up with them. I will be looking to sell the few remaining BDC positions held in IRAs when I can do so at a profit. Once a position is eliminated, I will not buy the shares back. The market reacted positively to this report, taking DIR-UN.TO up C$.28 or 3.13% to close at C$9.23. This Canadian REIT is currently paying a monthly distribution of C$.05833 or C$.7 per unit annually. ETF Description: The Arrow Dow Jones Global Yield ETF (GYLD) attempts to track, before fees and expenses, the Dow Jones Global Composite Yield Index. That index is comprised of multi-asset classes across five global yield categories, as noted in the snapshot below. The global sovereign debt exposure is in what I would call riskier sovereigns, either on a credit or currency risk basis or both. That can be observed by reviewing the list of holdings which includes debt issued by Turkey, Venezuela, South Africa, Panama, Hungary, and Columbia. Those sovereigns at least pay more than the developed nations, whose ten year bonds are making a run toward zero. The expense ratio is too high at .75%, which I view negatively for this kind of ETF. The USD is showing no signs of becoming fatigued as a result of its steep climb up. The following charts highlight the declines in the currency referenced first against the USD. The sponsor describes the "principal investment risks" starting at page 3 of the Prospectus. Currency risks contributed to the net asset value per share decline since I sold shares at $28.32, as described in the "Prior Trades" section. Prior Trades: I have two prior round trips. Rationale: Given the significant rise in the ten year treasury yield since 2/2/15, I decided to eliminate this position due to interest rate risk concerns. When buying this ETF, I made the following statement. "I do not have a price target. Generally, I am satisfied with this kind of investment when I can generate a 10% annualized total return." I did not make to that 10% annualized return but my holding period was just 1+ months. Company Description: Svenska Handelsbanken AB ADS (SVNLY) is a large European bank based in Sweden with operations throughout the Nordic region and in Great Britain. 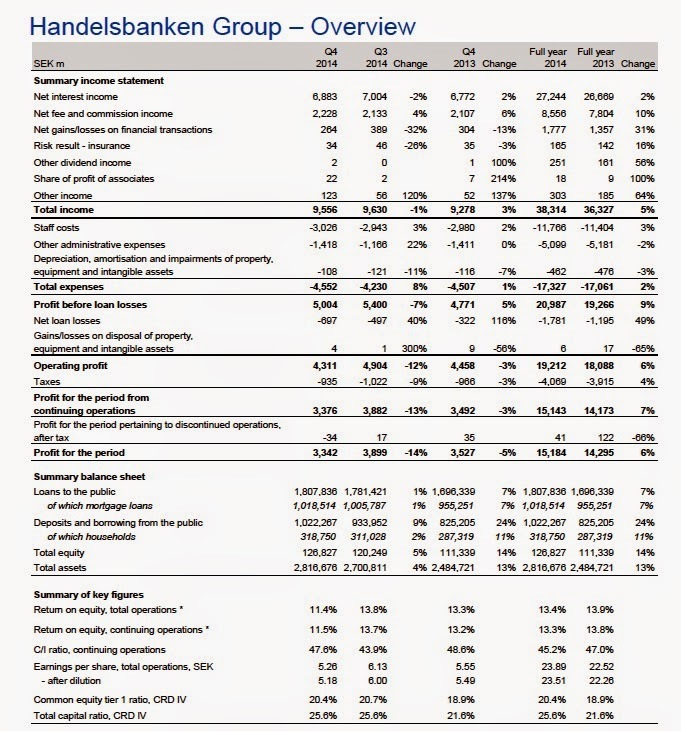 Based on a 2013 analysis by Bloomberg, Handelsbanken was rated the strongest bank in Europe and the eleventh worldwide. Toronto Dominion, another recent purchase, was ranked at #8. When announcing 4th quarter results, the Board proposed a 3 for 1 stock split subject to shareholder approval. The Board further proposed an annual dividend of Swedish Krone (hereinafter SEK) 12.5 per share and a special dividend of SEK 5 per share. Operating profit for 2014 was up 6% to 19,212 million SEKs. Profit after tax was also up 6% to SEK15,184M. Earnings per share increased 6% to SEK 23.89 compared to 2013. Link to a positive Seeking Alpha article on Handelsbanken published last January. I will not be repeating the factual statements about this bank made in that article. On the date of my trade, the ordinary shares had closed at SEK 399, up .4 or .1%. I consequently needed to divide the $47.3672 number shown in the preceding snapshot by two, which gave me $23.686 for the ADR share. 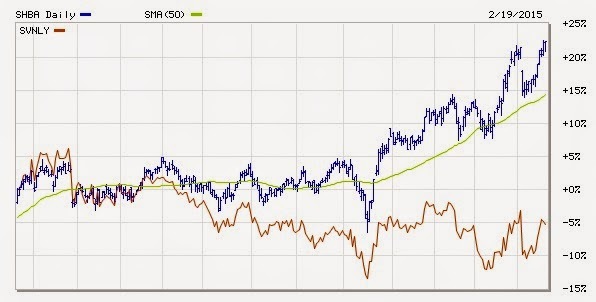 This is a ten year SEK/USD chart, which shows the SEK is near a ten year low vs. the USD. The following one year chart highlights the negative currency impact on the USD priced ADR that has declined close to 5% even as the ordinary shares have risen close to 20%. That substantial differential in performance highlights both the risks and potential benefits that are inherent whenever a U.S. investor buys a foreign stock. Currency risk is not avoided by buying a USD priced ADR. The ADR price will reflect the ordinary share price in the local currency (SEKs for this stock) converted into USDs. After an investor purchases an ADR, the general rule is a rise in the foreign currency against the USD is a positive event, which results in a higher dividend yield and a better performance for the ADR compared to the ordinary shares, while a decline in the foreign currency is a negative event for the same reasons. There are also other currency issues that are more indirect, such as the impact on earnings, revenues and overall competitiveness due to currency movements which can impact the ordinary share price and consequently the ADR price. An example occurred in mid-January when the Swiss National Bank ended its €1.2 peg. The Swiss Franc rose in value against both the Euro and the USD, making Swiss ADRs rise in price and increasing the value of their dividends paid in CHFs when converted into USDs. However, the rise in the CHF also caused the Swiss stock market to fall precipitously for a variety of reasons, including the impact of a higher CHF on earnings and revenues. The net impact was slightly positive for the U.S.D. priced Swiss ADRs. Long term, I see that currency impact on earnings and revenues diminishing, except for a few Swiss firms that mostly manufacture in Switzerland and export their product into weaker currency nations. Dividends: In my years of research, Handelsbanken is the only major company where I have not been able to find historical dividend information at the company's website. I found that omission by the bank to be extremely annoying and inexcusable. I found some annual dividend information at Morningstar for the U.S. traded ordinary shares: (SVNLF) A symbol ending in "F" denotes ordinary shares. ADR shares have "Y" as the last letter. For U.S. citizens, it is my understanding that Sweden will withhold 15% under its tax treaty with the U.S. Article 10; Treaty Rates | Deloitte International Tax Source. I will not buy any foreign dividend paying stock in an IRA where a tax is collected, since there is no way to recover that tax through a foreign tax credit, as explained in this Schwab publication. The following table contains relevant data. As noted earlier, the capital ratios are superior, with a 2014 year end Tier 1 ratio of 20.4%. 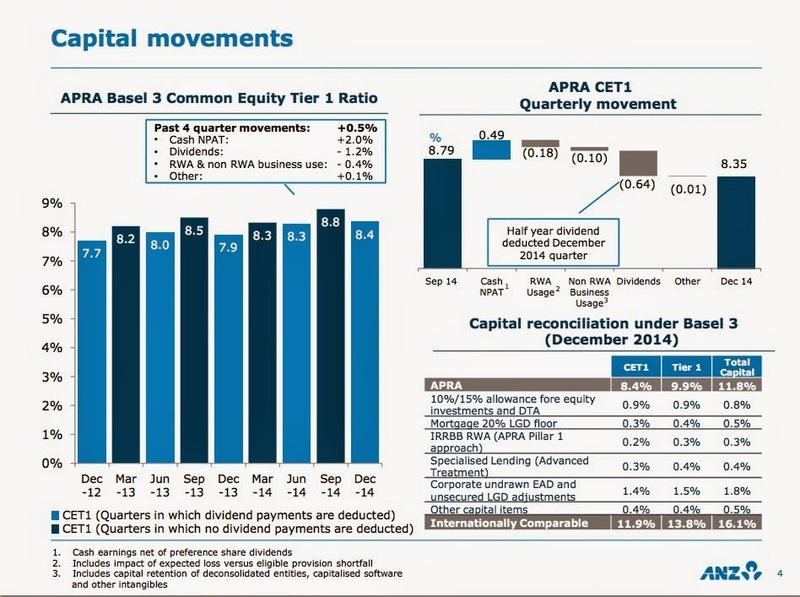 The 2014 return on equity of 13.4% (13.3% from continuing operations) is superior to U.S. banks of a similar size. The bank explained the earnings drop off in 4th quarter compared to the 3rd to "seasonal effects and increasing loan losses". Rationale: I try to keep this relatively simple for my own sake. Sometimes, it pays just to reduce these investment decisions to a few, easily understandable core reasons. 1. This bank appears to be rock solid. 2. The dividend provides some support to the current stock price and has been increased in recent years. 3. The ADR share price has been negatively impacted by over 20% due to the SEK's decline in value against the USD. That fact removes the currency risk that is already reflected in the ADR price. 4. Recent periods of USD strength have been relatively short lived, as shown in the currency charts, including this ten year chart of the EUR/USD: EUR/USD Chart If the SEK/USD returned to its 4/10/14 value as of .1543, and the ordinary shares remained at SEK 399, the ADR would rise to about $30.77 or 30.13%, just on the currency conversion. The annual dividend would also become more valuable at an exchange rate for the SEK higher than the one prevailing at the time of my purchase. Risks: The abnormal interest rate environment is squeezing bank net interest margin's throughout the developed world. Currency risk is major as highlighted above. And, without question, there are a lot of games being played now by central banks that are substantially impacting currency exchange rates. Who really knows when continuous central bank manipulations will end? The bank summarizes risks started at page 50 of its Annual Report linked above. 3. Bought 50 of the Synthetic Floater GYB at $20.72-Roth IRA (see Disclaimer): This one has some quirky tax issues so I buy it in the ROTH IRA. Security Description: The Corporate Asset Backed Corp. CABCO Series 2004-101 Trust Goldman Sachs Capital I Floating Rate Certificates (GYB) is a Synthetic Floater in the Trust Certificate form of ownership, a category of Exchange Traded Bonds. GYB makes quarterly interest payments at the greater of 3.25% or .85% above the three month Libor rate on a $25 par value. As with other exchange traded synthetic floaters, there is a maximum coupon. For GYB, the maximum is 8.25%: Prospectus Interest payments are made quarterly. The last ex interest date was 2/11/15. The underlying bond owned by the trust is a trust preferred issue from Goldman Sachs Capital I maturing on 2/15/2034 with a 6.345% fixed rate coupon. In effect, the underlying security is a junior bond from GS. That rate will not be received by the owners of GYB unless the swap agreement terminates. There was one swap termination due to Lehman's bankruptcy, where the owners of the synthetic floater started to be paid the higher coupon amount of the underlying security (the TC JBK). The owners of GYB will be entitled to receive $25 per trust certificate on 2/15/2034, assuming GS survives of course. If GS goes bankrupt, I would expect this security to be worthless. This short term rate would have to rise above 2.4% during the relevant computation period to trigger an increase in the 3.25% minimum coupon. Based on current Federal Reserve monetary policy, a reasonable forecast would be a continuation of the minimum 3.25% for at least another 2 years. By buying GYB at a discount to par value, I am able to juice the yield some. At at total cost of $20.72, the effective yield rises some to 3.92%. Whatever the yield turns out to be, I at least transform it into a tax free one by placing this purchase in the Roth IRA. One notable difference between GYB and GJN is that the underlying security in GYB, a 2034 trust preferred issue, does not contain an escape hatch for a "capital treatment event" that would allow Goldman Sachs to avoid a make whole payment for an optional redemption. Sold 50 JBK at $22.75/Reassessment of Current Synthetic Floater Positions; Item # 3 GJN Redemption (near the end of that post) I discuss this issue in more detail in those linked posts. It needs to be remembered that large financial firms will screw their own customers to make a buck for themselves. That has happened repeatedly over the years. It would take a very large book to describe all of the gory details. And, it will continue to happen for as long as individuals elect to do any business with them. I have flipped this security so many times that it is just one big blur to the OG. I never have had much exposure to it, mostly 50 to 150 shares at any given time. A major disadvantage is that the minimum coupon will likely be payable for at least another two years unless there is a currently unexpected rise in inflation that causes the FED to raise the Federal Funds rate at a faster pace than currently anticipated by the market. A major advantage is that the security provides a measure of inflation/deflation protection in the same security. I would anticipate that this security will likely rise in value when the short term rates start to increase provided the expectation is for an activation of the Libor float provision and no material adverse change in Goldman's creditworthiness. In the current low short term rate environment, a price rise to $22 or so has stalled and went into reverse. The price was closer to $24 in 2006 and of course cratered in a big way during the Near Depression, which highlight the credit risk issue. As noted in the "prior trades" section, I may my first purchases at $10.95 and $11 back in 2009. Assuming all goes well with the credit risk and other risks, there is some potential for capital appreciation by holding the security to maturity or possibly selling at or near par value earlier when the merits of the .85% spread to the 3 month Libor rate is more apparent than now.